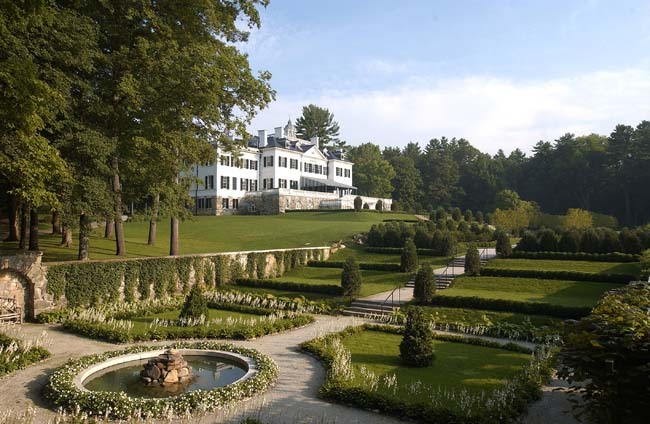 The Pulitzer Prize winning author Edith Wharton came from a privileged background and made a bob or two from her writing – enough to build this wonderful home, The Mount; but despite being rich and successful, she was always bucking gender limitations, not the least the accepted blueprint for women of her class as wife and hostess. Like ambitious women of every age, she had to bust through a number of historic obstacles: she was the first woman to win a Pulitzer, the first to be awarded an honorary PhD from Yale, and the first woman full member in the American Academy of Arts and Letters. So it is fitting that The Mount should be one of only 5% of National Historic Landmarks dedicated to women. In this, Wharton’s 150th birthday, The Mount is offering tours, films, exhibitions, jazz evenings and literary events. Building on the proceeds of her books, Wharton constructed the house and gardens in line with the theories she outlined in her 1897 book The Decoration of Houses (co-author, Ogden Codman, Jr.) Repulsed by the overwrought summer homes of her Gilded Age peers in Newport, she went for simplicity and neo-Classic lines. The house was to be her writing retreat, not a center for entertaining. It was constructed to erase the strict boundaries between outside and inside, and to be as unwelcoming as possible for unwanted guests, while comfortable and aesthetic for those welcomed into the private areas. With the dissolution of her marriage to Teddy Wharton, the writer sold The Mount in 1911 and moved with her possessions to France. Her painful affair with the cad, Morton Fullerton (who her best friend Henry James also found appealing), lasted 2 ½ years. She only returned once – and it wasn’t for her mother’s or Teddy’s funeral, but rather to receive her honorary PhD. The house passed from private hands to a posh girls’ school to the home of the Berkshire theater organization Shakespeare and Company before it was reclaimed as The Mount. During the restoration of The Mount (starting in 1980), the structural aspects of the building were kept true to Wharton’s original, but everything else (i.e., what could be lifted and removed) was approximated by contemporary designers who each worked on a room, attempting to follow her book on decoration. They did succeed in repossessing her magnificent library, with the evidence – in underlines and notes – of her prodigious reading, which she was able to do in Italian, French, German and Anglo-Saxon. (She found Dickens boring, so his novels remain pristine.) Her bedroom is unusually roomy and light, and it is where she wrote, in bed, every single morning from 6:00 to 11:00. The gardens were her special project and she collaborated on them with her niece, who went on to become a major garden designer. The injection of formal planning into the midst of natural forest growth really works. An Italian garden on the right and a French flower garden on the left are joined together, perhaps with some irony, by a British lane of uniformly large trees. Above the far corner is her pet cemetery. While Wharton never had children, she was a dog freak, seating them around her dining table, on which sat a jar of canine biscuits. Edith Wharton was the most successful writer of her day, allowing her and Teddy to keep 10 house staff and 10 garden staff (there were 150 acres in the estate) all to themselves. She was amazingly prolific and the wall on which hang all of her book covers (including the disconcertingly post-Modern design of the original Age of Innocence) includes volumes that even the most conscientious literature student has never heard of. The foundation that has re-established The Mount has turned it into a splendid place to visit: the house and grounds are beautiful and the terrace café serves an indescribably scrumptious local berry crumble. Sue Katz, an author, journalist, blogger and rebel, used to be most proud of her martial arts career and her world travel, but now it’s all about her edgy blog Consenting Adult. Sue is a regular contributor to Open Media Boston. Photo by David Dashiell. Courtesy of The Mount website.